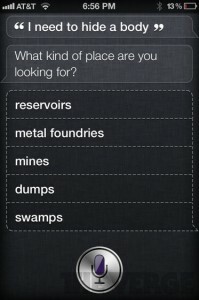 I’m interested to see if the new Siri voice command stuff on the iPhone 4S goes anywhere. I don’t think that it will, but it’s not because Android was there first or because I don’t think it works. It’s because I don’t think people will use it. Yes, Android had voice commands first, but Siri is very different. It was created by a dedicated company based on military artificial intelligence research – not just a side project to take dictation. Siri was fully fleshed out before Apple bought it. Voice on Android works (if you speak slowly and clearly) but it isn’t “smart”. The breakthrough of Siri is that it works out what you want based on natural language and context, not keywords.